There is a bushfire perilously close to a community in Victoria as four of the nation's best minds in disaster preparedness and recovery meet to talk about the cost of natural disasters. In Australia, the average annual cost of natural disasters is estimated at $6 billion. This is expected to triple in 30 years as fires, floods and storms feel increasingly common. The predicted tripling of disaster losses, however, is not because of increased severity and frequency -- though trends related to heatwaves are emerging. 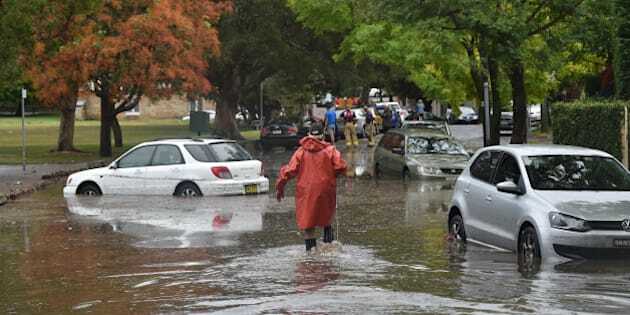 Geoscience Australia hazard risk assessor Martine Woolf said the increase was to do with the fact that Australians had more assets than ever before. "Over the last half a century or so, disaster losses have risen incredibly steeply -- there's almost no year with no losses but certainly, every year, they seem to be going up," Woolf said. "The trend is very steep and you can think 'hell, where is it going to end and what might next year bring?'. "The real trend driving these losses up is not necessarily one of more severe disasters. At this stage, the main driver is the way that we've become more wealthy over time." Martine said data of losses related to disasters were most probably lagging behind. "There is definitely evidence that certain disasters are getting more frequent and severe associated with increasing temperatures such as heat waves and bush fires. "What's harder to prove is how it translates into losses." Reinsurance company Swiss Re's Head of Property Treaty Underwriting, David Sinai, agreed. "We’re putting more assets in harm’s way in the last several decades," Sinai said. "[A predicted tripling of losses is] more reflective of property growth and building in risky areas than it is in long-term changes of frequency or severity of disasters themselves." Indeed as Australia's population has grown to 24 million this year, urban areas have become more populous, including 'risky' regions like flood-prone areas in Brisbane, demonstrated in alarming detail during the 2011 floods when 47 people died and $2.38 billion in damage to property was incurred. Are there some parts of Australia where people simply shouldn't live? Sinai said modelling could predict the likelihood of some natural disasters. "If you're building on a flood plain where you expect a building to be flooded once in on average every 20 or 50 years then we know in the life cycle of that building it's going to be inundated. "For me, that's just too risky and that's putting assets in harm's way. "If we look at building in other high risk areas like tropical cyclone for example, a lot of the potential damage can be mitigated through building codes and reducing the vulnerability." Sinai said the housing stock in Darwin changed dramatically after Cyclone Tracy destroyed 90 percent of residential properties, so building codes required rebuilt homes to be able to endure a cyclone. Cyclone Tracy spurred major changes in building standards. "It's not necessarily about where we build, it's also about how we build." Monash Business School researcher Paul Raschky said individuals needed to decide themselves where they wanted to live. "If you are willing to pay a relatively high insurance premium and are willing to build very resilient houses, that's perfectly fine in the society we are living in with certain liberal values," Rashky said. Homes can be rebuilt but one impact of natural disaster that was seldom talked about was mental health, said Telethon Kids Institute clinical psychology senior researcher Jessica Tearne. She said that one year after Ash Wednesday, 43 percent of those directly affected met the criteria for psychiatric diagnosis while another study on Black Saturday survivors three years on found 15.6 percent still met the criteria for post traumatic stress disorder. "There are bushfires happening in [Western Australia] at the moment and I was thinking about the town of Yarloop entirely wiped out by an out-of-control bushfire and we're only just starting to see the psychological impact of that and there's no doubt there are going to be long term psychological impacts. "We need broader public health strategies to develop better mental health infrastructure to be able to deal with the psychiatric fall out after these disasters."